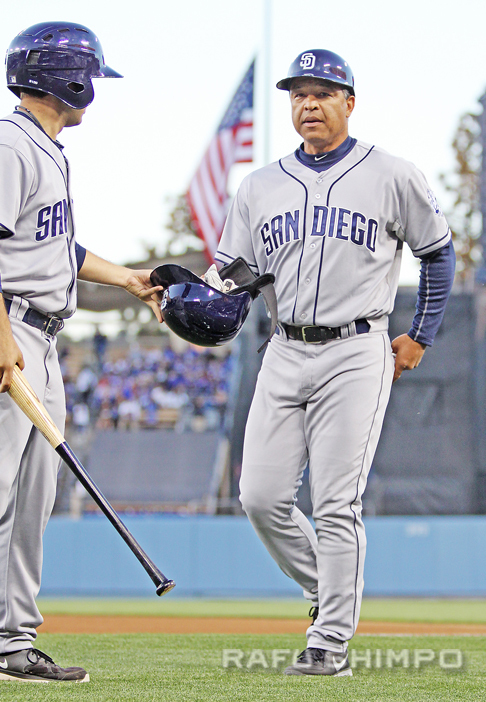 Few would protest attaching that kind of description to Padres bench coach Dave Roberts, the former Dodger, former UCLA star, and Okinawa native, who made his debut as Major League manager – albeit a short one – on Monday. Roberts was named San Diego’s interim manager for Monday’s game against Oakland, after the team fired Bud Black. The Padres retooled their lineup top to bottom during the off-season – including adding former Dodger Matt Kemp – and opened 2015 with their largest season payroll in team history, over $108 million. In spite of the improvements, the Padres have been languishing under the .500 mark and in third place in the National League West standings. In his eight-plus seasons as the skipper, Black never led the team to the postseason. What Black did right, however, was to surround himself with knowledgeable coaches and support staff whom he trusted and relied upon. Enter Roberts, baseball savvy, perpetually upbeat with a million-dollar smile, and a caring knack for being able to communicate with players and to earn their trust and respect almost effortlessly. In May 2013, I had a brief chat with Roberts, and we discussed his recovery from lymphoma and his possible future as a big league manager. He’d be the first to say that he would much rather his route to the top job not come at the expense of an old friend like Bud Black. Roberts, who joined Black’s staff in 2010, called his former boss a friend and a mentor after being tapped to helm the team. “It is very emotional. I’ve never been in this situation,” Roberts told the Associated Press. As it turns out, the learning process was rocky and brief. With Roberts as the skipper, the Padres were humbled by the visiting A’s, 9-1. A little salt in the wound was provided by the fact that Oakland won behind starter Jesse Hahn, the former Padre who was traded last year. Roberts’ tenure as San Diego manager ended early Tuesday, when the team named Pat Murphy, manager of their AAA El Paso affiliate, as the man to lead the Padres at least through this season. Traded to Boston in 2004, Roberts’ name will be forever linked to the World Series championship run of the Red Sox that season, for a single play. In his only appearance in the American League Championship Series against the rival New York Yankees, Roberts was inserted as a pinch-runner in the ninth inning, trailing the Yankees by a run, down to their last out and facing the game’s best closer in Mariano Rivera. Everyone in the stadium and those watching across the country knew exactly why the speedy Roberts was in the game: to steal second. And by a margin of a few centimeters, that’s exactly what he did. Roberts came around to score and tie the game on a base hit, and The Sawx went on to stun the Yankees to win the pennant, continuing on to end more than 80 years of futility by defeating St. Louis for the championship. While his first experiences as an MLB manager will like soon be lost to history amongst the day-to-day operations of the Padres and the rest of baseball, it seems pretty clear that Roberts will again be offered the top post by some team, at some point – hopefully, under more favorable circumstances. Bruce Bochy, for whom Roberts played in San Francisco from 2007-2008, told ESPN that Roberts has a wealth of knowledge and would do well as a manager. “Dave’s a good baseball man. He’s coached first, he’s been a bench coach. He’s worn some different hats. He knows all aspects of the game,” Bochy said. There’s that term again: a good baseball man. Oh, one more thing. If you haven’t been watching the 2015 Women’s World Cup soccer tournament, currently being held in Canada, you’re missing a couple of interesting events. First, they’re playing some great football – yes, I call it football – by some of the best players in the world of any gender. Brazil features the spectacular Marta, the U.S. has the nearly unstoppable Abby Wambach, and Japan is led by Homare Sawa, pound for pound perhaps the most versatile and reliable athlete in the tournament. Second – and most unfortunately – is the involvement of the artificial turf on which the matches are being played. The was a great deal of howling over the decision to play on the rug, with good reason. I attended a viewing of the Japan match against Cameroon on Friday, hosted at the Fox Studios in West L.A. and shown in ultra-high-definition 8K resolution from Japanese broadcaster NHK. In stunning clarity and crisp sound, we could see players routinely slip and slide over the fake grass, stymieing some brilliant moves and raising the very real risk of serious injury to the players. I’ll add my voice to those who have complained that such arrangements would never, ever be accepted for the men’s World Cup. Well, duh. But of course, FIFA has a few other problems on their plate at the moment. The whole affair again demonstrates how women’s sports are treated with second-class indifference. No one can forget how, after winning the last World Cup and becoming an inspiration for their nation, Japan’s women’s team was flown in coach class on a flight to Paris, while their male counterparts relaxed in business class. Japan won Tuesday’s match against Ecuador, 1-0, to finish a perfect 3-0 in pool play and advance to the Round of 16. If they win the Cup again, will the trophy get to ride in first class?